When one examines the old saying, “not what they used to be” it occasionally bridges a connection to a lesser form of sorts. In this case, it’s nothing but celebration when we as downtowners willingly proclaim, “hotel lobbies are not what they used to be.” The front-runner to recognize for fostering this viewpoint within the hotel hospitality is undoubtedly Freehand Los Angeles. Inside is electric with energy and paints a panache signature on what it means to contain a bustling lobby full of endless splendors. The heart of is this elaborate and stylish ecosystem is Rudolph’s Bar and Tea—built for visitors from far or locals down the block. The aesthetic is one you could only describe as majestic mid-century-modern. Wooden accents collide with comfortable carpet and foliage, offering a mountain lodge spirit circa 1978. Chocolate tile stacks up underneath a polished bar top amassed with a collage of ingredients as Rudolph’s calls to wanderers with an array of organized bottles and faultlessly angled bar chairs. 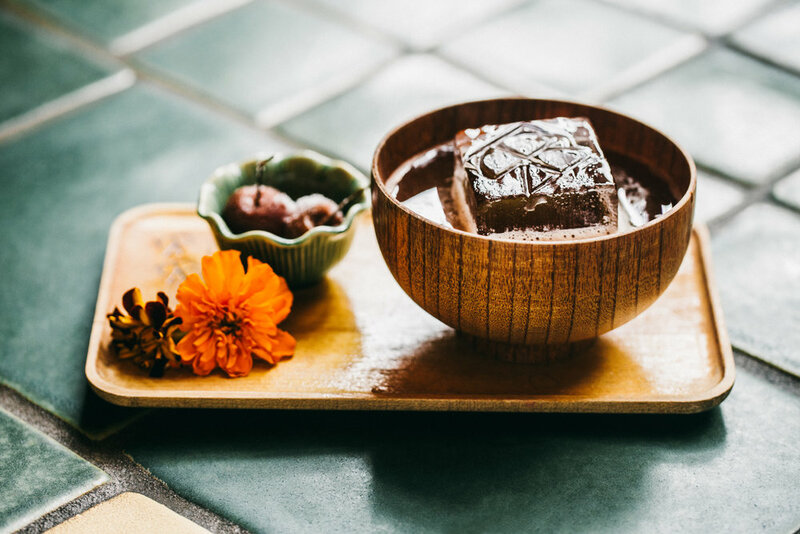 The menu is on its third chapter of stunning drinks, primed by coffee and tea-infused cocktails that aim explore different flavor notes around the world. Matt Swartz is the Director of Outlets, he is inspired by the success of the teams undertaking. “There’s something to be said about taking an elevator down, or walking in after work, to find one of the best cocktail programs in the city.” Order the We’re Not In Kansas Anymore and you’ll agree, made with Ballentines Scotch, fresh lemon, coffee-infused Put e Mes, and cherry bitters. Rudolph’s stays active with our neighborhood too. Jazz Impressions is on the first Thursday of every month, and Art Walk participation takes place every second Thursday. Perhaps the most coveted part of this eccentric dwelling, do we dare say is the most elite happy hour in town? We do. Cozy up anywhere in the room every day from 2:30-5pm to find items like hummus for $2, crab croquettes for $6, a mouthwatering burger for $8, and $4 beers with $6 vino or a daily punch—just to name a few. Dan Daley, the Food and Beverage Outlets Manager, conducts Rudolph’s Bar and Tea’s free-flowing nature. He recognizes how the setting plays a vital role in DTLA’s culture, “within downtown, it’s necessary to escape. We serve our different cocktails and the stories behind them for you to be lost for a moment.” Dan explains how lead barman Chris Raba fashions wild concepts into reality, “he brings an idea to me, I get the pieces from Matt, and we go for it.” Chris’s passion is evident in his strive to create experiences in a glass, a true classic cocktail rockstar who’s pushing the boundaries of original takes with modern twists. Dan, Chris, and Matt aren't alone in Rudolph’s, they have an army of owls. Yes, owls. After a few glasses from the dialed in natural wine list, test yourself to see how many owls you can find in the open space. The bird is Rudolph’s spirit animal. Makes sense, as the owl is emblematic of a deep connection with wisdom and intuitive knowledge. Rudolph’s Bar and Tea and its empowered team help’s our city understand lobbies don’t have to be what they used to be, and they never should.